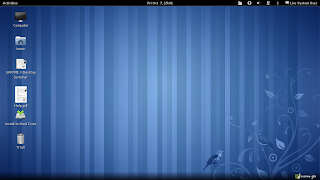 Das U-Blog by Prashanth: Review: Kororaa 15 "Squirt"
I've reviewed Kororaa before, and that was version 14 "Nemo" which featured KDE 4.6 and GNOME 2.32. 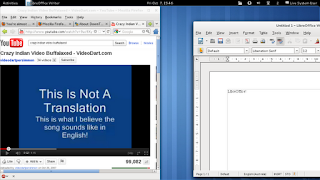 This new version 15 "Squirt" has an unchanged semi-major version of KDE, but GNOME has been upgraded to version 3.0. Other applications have been updated too, so I figured it would be time to give it another go. 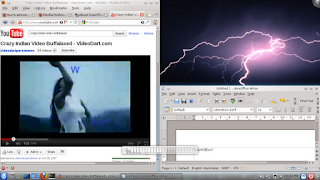 I tested both versions through live USB systems made with UnetBootin. I did not test the installation processes because there haven't been significant changes to the Anaconda installer since Fedora 14 "Laughlin". Follow the jump to see what each is like. After the boot menu, I was greeted by a couple lines of text ominously reporting some odd failure regarding my NVidia graphics card. I was a little concerned that Kororaa wouldn't boot at all and I wouldn't be able to write this, but thankfully, about 10 seconds later, I was greeted by the KDM login screen. It has been customized heavily compared to the stock KDM 4, which is nice; my only small issue is that it requires the user to click to log in when the username and password are already entered, so I don't know why the developers didn't just skip the login process in the live edition entirely. The setup of Kororaa is extremely vanilla KDE 4. There really isn't much to say here, other than the facts that the wallpaper is a slideshow of pictures, there are some other themes available, and otherwise it looks much like Kororaa 14 "Nemo" KDE. Mozilla Firefox is present at version 6. It worked fine, and after I was able to add multimedia codecs, YouTube and Hulu worked fine, as did my laptop's sound card and volume keyboard shortcuts. Also, I really liked the Oxygen KDE integration; not only did the theme integrate very well, but Mozilla Firefox used the native KDE dialogs, which I find to be a lot more appealing for some reason (as opposed to using the Mozilla Firefox dialogs specifically in KDE). Adding those codecs was a little more time-consuming than I anticipated, though. I mean, once I found the package manager, I could search for the codecs and install them fine. The problem is that Kororaa has 3 package managers included: in the KDE edition, only YUM Extender works, while KPackageKit and Synaptic Package Manager, which are also included, don't work at all. KPackageKit constantly crashes (note: I actually subconsciously typed "KPackageKit konstantly krashes" the first time), while Synaptic Package Manager only shows already-installed packages and can't seem to get packages from the repositories at all. Thankfully, YUM Extender is fairly straightforward and does its job well. Another nice thing about it is that it offers to close itself after a job is finished. Similarly, installing packages not in the repositories was a bit annoying: I speak specifically of Skype and the Google Talk voice/video browser plugin. After downloading these RPM files, Mozilla Firefox gave me the option of opening them with one of the aforementioned three package managers; none of those worked, as they kept giving me odd errors. Eventually, I had to save the files in a folder, find them in Dolphin, and right-click them to open them with the Software Installer to actually install them; sadly, the Software Installer was not one of the suggested programs in Mozilla Firefox, and I couldn't find its binary file in the /usr/bin/ folder. I think the developers need to fix that: if an RPM file is downloaded, the suggested program with which it should be opened needs to be the Software Installer. After that song-and-dance was over, thankfully both Skype and Google Talk worked flawlessly, recognizing my laptop's webcam and mic out-of-the-box. 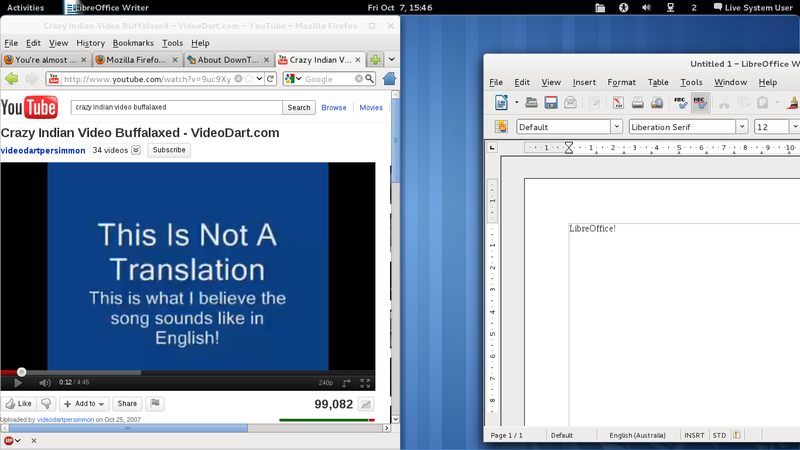 Other installed applications include LibreOffice, VLC, KDE games, and other stuff included in version 14 "Nemo" as well. 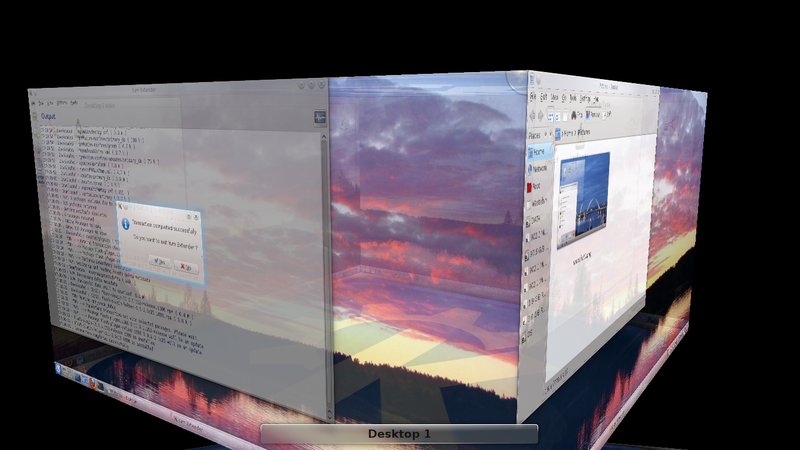 KWin desktop effects worked fine, which is good. In terms of memory consumption, according to the KDE system monitor, the desktop used 330 MB of RAM at idle with desktop effects disabled, and 360 MB of RAM at idle with desktop effects enabled, which I don't think is so bad, considering that I've seen KDE use on average about 400 MB of RAM at idle. Also, compared to version 14 "Nemo", version 15 "Squirt" did not give me any kernel panics. On that note, unfortunately, as I was typing the third paragraph of the post, something in the desktop froze up. I don't know if it was Mozilla Firefox or KDE, so I'll lay the blame equally, but the whole system came crashing down to its knees. That's much more serious than a "kernel panic" (as in version 14 "Nemo") that doesn't actually do anything do the system. That's where my time with KDE ended, and honestly, it left a bit of a sour taste in my mouth. After getting past the boot menu, the same warning showed up, and again, it took about 10 seconds to get past that into the GDM login screen. After the automatic login (and again, given that this is the live edition, I think it would be better to skip the login screen altogether), I was taken to the desktop. 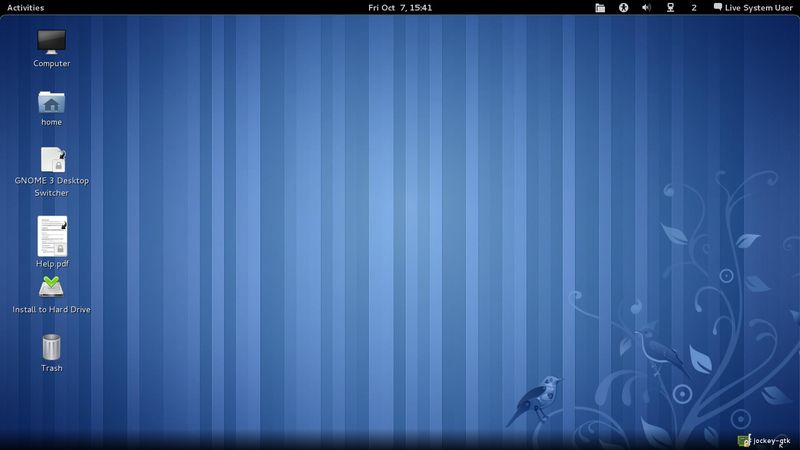 Unlike the KDE edition, which is pretty vanilla KDE 4.6, the GNOME edition is GNOME 3.0 but subtly customized. For example, there are desktop icons where there were none before (including the help document as from the previous version, which is nice), and this also adds the ability to right-click on the desktop as in GNOME 2.X. There are also some extensions on the panel, like the "Places" widget, and the addition of an option to shut down (and not just log off). The Activities view has a Themes pane in addition to Windows and Applications; given that I've never seen it before and despite the fact that there's only one other GNOME 3 Shell theme included, I'm guessing this is an addition by the Kororaa developers, so kudos to them on that. 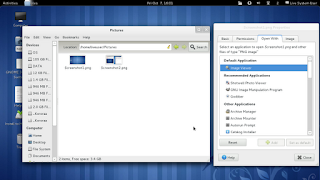 The default Mutter and GTK+ themes are Adwaita as in stock GNOME 3, but the default icon theme is Elementary as was the case in the GNOME edition of version 14 "Nemo". Overall, the desktop looks and feels a little better than stock GNOME 3. There are a few other nice things about the desktop, some thanks to the Kororaa developers, others thanks to the GNOME developers. One is that when the last window in a workspace is closed, the workspace is automatically changed to one that has open windows unless there are no other workspaces with windows open. Another is that the windows have buttons to maximize and close, but not to minimize; I think that's a nice compromise between having all 3 buttons, as minimizing doesn't make sense in GNOME 3, and having just one close button, as users will still want to maximize their windows without clicking and dragging. However, one issue I did have is that some windows like Mozilla Firefox's "About" window completely lacked buttons to close the window, so I needed to right-click on the window titlebar and select the correct option to close it, which is quite cumbersome. Then again, I don't know how often such windows will be opened in the first place. The other goody included by the Kororaa developers is the icon to switch from GNOME 3 Shell to GNOME 3 Fallback, though rather confusingly, it is named either "GNOME 3 Desktop Switcher" or "Switch GNOME 3 Desktop", and neither of those make it clear that the user is going to switch to GNOME 3 Fallback. I'd suggest the name "Switch Between Shell and Fallback", or something like that. 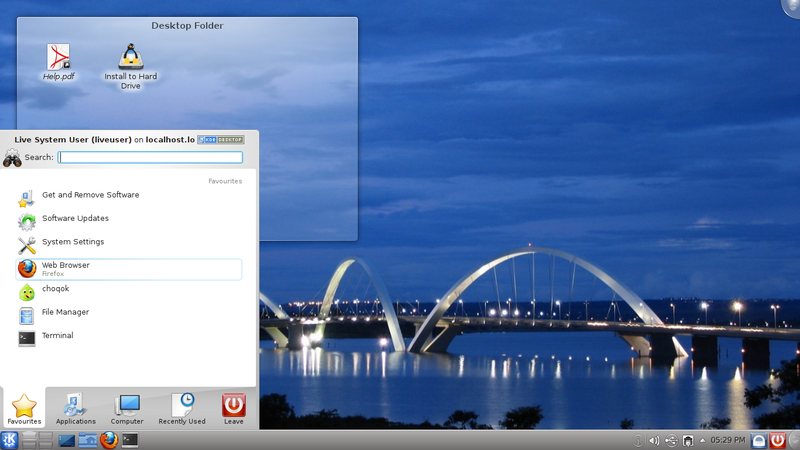 The included applications were mostly the same in the GNOME edition as in the KDE edition. The only other very minor issue I encountered was that Mozilla Firefox used the Clearlooks GTK+ theme instead of the Adwaita GTK+ theme, as evidenced by thinner blue scrollbars instead of thick white scrollbars. Of course, that's just a small aesthetic thing, so it's not a big deal. One other thing I did see was that now GNOME 3 uses modal dialogs, which are dialogs that slide down and up and have no window titlebars (i.e. they are fixed with respect to the parent window); I'm pretty sure they were first found in Apple's Mac OS X. I'm not really sure how I feel about that, but I'm glad to see that applications like Mozilla Firefox and LibreOffice which are not true GTK+ applications also use modal dialogs, and that makes the whole experience more consistent. I didn't try installing other packages again because I knew it would be mostly the same; in any case, the same 3 package managers were included, though this time it was only Synaptic Package Manager that refused to cooperate, as both YUM Extender and PackageKit worked fine. Unfortunately, GNOME 3 and Kororaa came with quite a few annoyances as well. The first is that the sound theme is kind of annoying. For example, if I wrote some text in Gedit and then tried to move the cursor beyond the end of the file, it would make a dinging sound eerily similar to the one included in Microsoft Windows (and there, it too sounds when the keyboard cursor is moved beyond the end of a text file). I haven't seen this in any other distribution, so I think that needs to go. The second issue is that some applications didn't work as expected despite being included. The first of those was Gloobus Preview, which is a super-versatile file previewer that I use in Linux Mint on a regular basis. The problem was that I couldn't get any file to open with Gloobus Preview via the GUI; I had to open files in Gloobus Preview using the terminal, which was cumbersome and frankly pointless for quick previewing. In addition, Gloobus Preview doesn't seem to have a settings manager anymore, so I couldn't set the keyboard shortcut to quickly preview a file within Nautilus, which again defeats the purpose of quickly previewing files. Then again, GNOME 3.2 is supposed to come with a native quick file previewer called Sushi which is supposed to work basically like Gloobus Preview, so this point will become moot soon enough. The second application that didn't work was the GNOME Appearance Properties; I'm guessing that's because the application is deprecated in GNOME 3, but then I must ask why it was included and visible in the list of applications at all. These two problematic applications also made me see further issues with GNOME 3. With regard to Gloobus Preview, when I was in Nautilus and I tried to open files using non-default programs, I was given a list of suggested alternatives and a list of all commonly used programs to do the job, but I wasn't given the option anymore to enter a custom command (e.g. "gloobus-preview"). With regard to GNOME Appearance Properties, I couldn't find a single way to change things like the Icon, GTK+, and Mutter themes using a GUI. 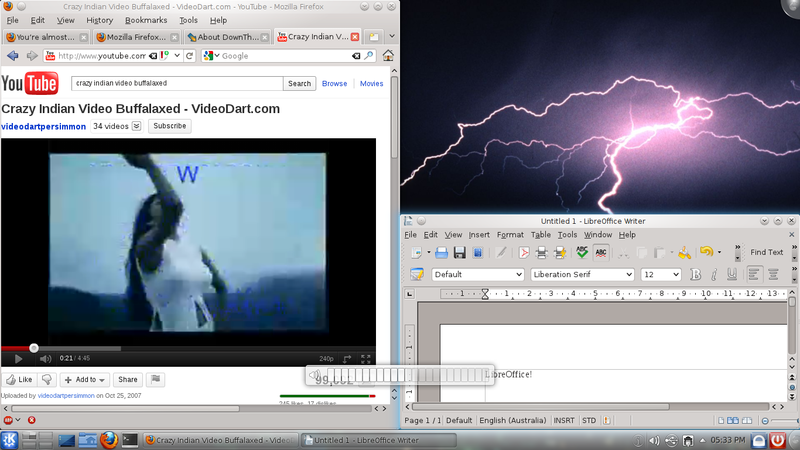 Well, I found out online that both of these things can only be fixed by editing GNOME text configuration files. This makes me wonder if GNOME has basically become something like Openbox but with a really polished default configuration, in that if the user wants to do any real customization, that person has to edit text files by hand, or else it's too bad for that person and they'll have to deal with the default workflow. Then again, GNOME 3 is certainly way less configurable than Openbox as far as I've seen. The final issue is that Nautilus doesn't appear to have breadcrumb support anymore, which is a pretty odd regression from GNOME 2.X. Now, all file paths are editable strings of text, which is great for power users but bad for users like me who just want to click a button to go up and down directories. GNOME used 350 MB of RAM at idle, which is basically as much as KDE, so now KDE isn't necessarily the heaviest DE. The desktop effects in Mutter worked fine, which is to be expected because if GNOME detects that they won't work, it should automatically revert to Fallback mode. That's where my time with GNOME ended. So what's the deal then? Well, in the KDE edition at least, Kororaa doesn't really bring any improvements over the previous edition. Instead, it brought me a Plasma crash I thought I'd never have to experience again. Now turning to GNOME, given that GNOME 3 is such a stark difference from GNOME 2, it's hard to make an adequate comparison because that would be like comparing apples to oranges. That said, I do appreciate the subtle tweaks intended to make GNOME 3 a little more usable, but GNOME 3 comes with its own set of problems to the point where I'd rather just not use it at all. The one other good thing about this version which was a sore point for me in the last version is that this has come out before Fedora 16 "Verne", while Kororaa 14 "Nemo" came out after Fedora 15 "Lovelock". Given all this, I don't think I could use Kororaa 15 "Squirt" on a daily basis, and if someone was interested in a user-friendly, stable Fedora derivative, I'd probably point them elsewhere (e.g. Fuduntu). You can change the icons and themes using Gnome-Tweak-Tool, which should be available in the repositories. Also, Appearance hasn't been deprecated. Something is wrong with the distribution you're using. I've used the Appearance settings in Gnome 3.0 AND 3.2 in Fedora, and they work just fine. @Jonquil: The awful part then is that the GNOME Tweak Tool isn't a default part of GNOME but is considered an "official extension". Also, regarding GNOME Appearance Properties, I guess it's a Kororaa issue then. Thanks for the comment! I totally agree with the above article. After getting my first build up and running (I was completely supervised by my friend and mentor who has several certifications and has been building computers for over 20 years now.) I installed Kororaa 15 KDE on it. What a load of crap! When using Jockey to download the NVIDIDA drivers as instructed and installing them and going into desktop settings to set slideshow my screen went black. I have tried several distributions and the only ones that work with NVIDIA are Ubuntu based. AT least Bodhi comes with them already in place. I am using Ultimate Edition 2.9 and it works like a charm. Kororaa has definitely taken a hug step backwards and has lost its credibility with me as have Fedora based distributions. Fuduntu 14.11 failed miserably as well. So Prashnath I totally agree with what you have written here. Kororaa has definitely gone bad and gone bad quickly. @Anonymous: I can't speak for the workability of the Jockey program, because I've never needed to use it; I mean, I tried installing the proprietary NVidia drivers with it, but I found the Nouveau drivers worked way better, so I stuck with them and I haven't needed to use Jockey since then. That aside, that is certainly bad that running Jockey landed you with a black unresponsive screen. I haven't used Fuduntu on a long-term basis, but I really liked what I saw in the live session at least, so I'm a little surprised to see that Fuduntu hasn't worked for you; on the other hand, I'm disappointed that Kororaa didn't really work out for me even in the live session, and that's enough to dissuade me from trying to check out the installation procedure and/or use it on a long-term basis. The only other moderately popular Fedora remix I can think of is Fusion, and while supposedly its version 15 has been released, I can't see it on the download page, and it doesn't appear to be a great release according to the user response on its site (though that may be more because of the backlash against GNOME 3 in general). It's really a shame that there's no huge community working to create an amazing Fedora remix like there is for Ubuntu & Debian with Linux Mint; plus, if you think about it, if you want a Fedora-like base but you want longer-term support (i.e. you don't want to have to upgrade every 14 months), I feel like CentOS shouldn't be that hard to customize and maintain, and it's bound to be absolutely rock-solid. Thanks for the comment! @PV- My only issue with CentOS is that it does not come with a lot of additional software, but being an Enterprise distribution I suppose it should not be. I liked it when I ran it live but since I am not a computer Guru I would not even have any idea of installing extra packages such as those for amateur radio, science, education, utilities etc. I really do not have the time to sit down and individually run a terminal for over 1222 packages that I really do need and like to have just for fun as therapy for my military service connected disabilities. But THANK YOU for your reply any way. @Anonymous: Well, I'm not sure exactly what packages you particularly need, but I have a feeling that even if you used Kororaa, you'd still need to install some other packages not already included, in which case I don't think it would make a difference whether you did the package installation with YUM Extender in Kororaa or PackageKit in CentOS. Thanks for the comment! Very valid points, thanks for the review. I'll see if I can address these major issues in a future point release. Appreciate the feedback! @Anonymous: And thank you for taking the points as calls for improvement (and not taking them as "your distribution stinks!")! 350Mb of memory in idle? Guys, it is way too much! That's a target for other systems. Where all the rest MBs go??? I also agree with PV: Tweak tool is not part of GNOME 3, but rather an extension. That's very weird that it is not included into core distribution. It's like seeing KDE without Settings panel. @DarkDuck: I've heard (though this still sounds strange to me) that distributions will use a bit more RAM if more RAM is available, though I agree that the difference is too great for that to be the only reason. That said, I haven't tried Mageia before, and I don't think I ever checked out the RAM usage of Debian KDE in the live session, so I can't speak for either of those. Thanks for the comment! OK, I've addressed all the issues I can address, I think. I can't do much about GNOME 3.0 - I mean you either like it or you hate it :-) I've tried to make it a bit more GNOME 2.x by enabling the desktop, etc. Can I ask about two things? The plasma crash - do you know what caused the crash? Did it happen more than once? Was it on log in, or after some time? Plasma shouldn't crash these days obviously, so I'm not sure what to do about that one, but if you have some more info I can try and duplicate it. Also, when you said you had to add multimedia codecs for the web - what did you add? Was this just Flash, or something more? Did you install the flash-plugin-helper package to get Flash working? @Chris Smart: Well, I commend you for doing what you've done with GNOME 3 to make it a little more palatable. I think my issues with that are mostly with GNOME 3 itself, and not with Kororaa particularly; that said, I did say that the GNOME Appearance Properties and Gloobus Preview should be removed, because neither of them work as intended. I think it would be a little better if you included the GNOME Tweak Tools instead. Also, regarding the Plasma crash, I was able to duplicate it, and it was some time after logging on, and it was while running Mozilla Firefox. Finally, regarding installing codecs, I'm not complaining about the process, because it's easy enough; my issue is that there are 3 package managers included, and in the KDE edition, 2 of them don't work correctly in live mode. I mean, sure, Synaptic Package Manager will probably work correctly after installation, but I doubt the KPackageKit crashes will go away post-installation. Plus, why not just stick with one, like the powerful yet easy-to-use YUM Extender? Thanks for the comment! In my tests now on 15.1, I can use kpackagekit without any crashes in live mode (just need to wait for it to populate its db first). I'm trying to work out how to pre-populate it but that's proving tricky under a chroot for some reason. For 15.1 I also fixed the configuration for and pre-populated apt/synaptic, but it just didn't work nicely enough, so I've removed it completely. So, 15.1 will just have PackageKit and Yum Extender - both should hopefully work properly. I've also confirmed that downloading an RPM via Firefox wants to open with PackageKit, and it installs correctly. * Renamed desktop switcher to "Switch between Shell and Fallback desktops"
Thanks a lot for your review, it's been very helpful for me to improve Kororaa. Hopefully I've addressed all the issues you raised. I'd love to hear of any other thoughts you have in the future. @Chris Smart: Wow. That might just cover everything! Thanks for all the great updates, and I will certainly revisit Kororaa 15.1 whenever it gets released! @Chris Smart: You're making me feel preemptively bad about possibly bashing you again! :P Thank you so much for taking what I've said here into account, and I look forward to reviewing version 15.1 now! I discovered that I didn't properly solve the GNOME lock screen issue. There were other GNOME shell options required, which I've now found and will apply for 15.2. Sorry about that! @Chris Smart: I am truly impressed by your dedication regarding persisting at finding and solving even the smallest of bugs. Thanks for the update! Review: Kubuntu 11.10 "Oneiric Ocelot"
Review: Edubuntu 11.10 "Oneiric Ocelot"
"Das U-Blog by Prashanth" is licensed under a Creative Commons Attribution-ShareAlike 4.0 International License. CC-BY-SA 3.0. Powered by Blogger.